The Frager Factor: The Domain Gravy Train Has Passed. Time For A Better Idea. The Domain Gravy Train Has Passed. Time For A Better Idea. How's That Million Of Yours Coming? A couple of days ago I reminded you about Canopy Growth Corporation. If you bought it 2 days ago when I recommended it at $40- it actually slipped to $37 and I bought 1000 shares more. So I invested $37K and two days later its at $46 and worth $46K. And in the next 5-10 years it will be like Google and Amazon approaching $2,000 a share. You can't do this any more with domains. And there's only a few stocks in a lifetime that ever afford an opportunity like this at all. Why? Because the feds are bogarting the weed, while Israel and Canada are grabbing market share. The global legal marijuana market is expected to reach USD 146.4 billion by end of 2025, according to a new report by Grand View Research, Inc. Growing adoption of marijuana in several medical applications such as cancer, mental disorders, chronic pain and others is expected to propel revenue growth in near future. Legal marijuana has started gaining traction worldwide due to very high demand among consumers and increasing legalization of recreational or medical marijuana in various countries. Additionally, high public and private investment for research and the development of safer forms of ingesting marijuana such as tinctures, oils, vapes and other edibles are expected to positively reinforce market growth. The number of conditions treated using medical marijuana is growing rapidly, as new patients are added to the market, the demand for medical marijuana is expected to increase multiple folds over the forecast period. Countries like Canada and the U.S. are moving towards legalization of marijuana for recreational purposes, this in turn is expected to create a shift form medical to recreational marijuana. Lengthy purchase and approval process for medical marijuana prescription and ease of availability of recreational marijuana is expected to trigger this this change. 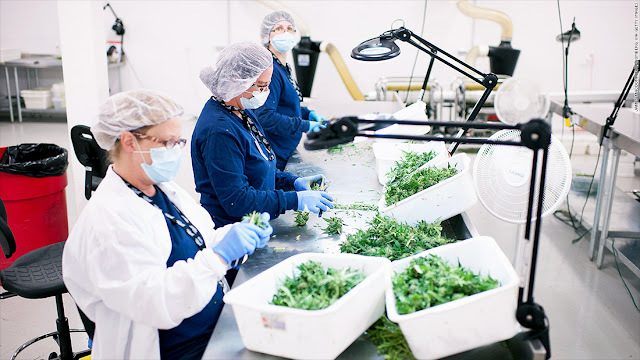 Increasing number of companies operating in the marijuana market is expected to bolster the quantity and variety of products reaching the end users. Products like marijuana oil have started gaining traction over the past few years owing to increased effectiveness and safety as compared to smoking it. Also, the growing research in cannabis industry has led to introduction of new marijuana strains. These advances in new product development is expected to enhance product adoption among consumers. Legal marijuana market is witnessing strong technological and information exchange. Countries like Canada, the U.S., Germany and Australia are expected to emerge as leading markets in terms of sale, whereas, countries like Israel are focusing on research and technology development and are leveraging on knowledge transfer.